An extensive research about the invention of the running machine in 1817 and the issue whether or not it was influenced by the eruption of the Indonesian volcano Tambora in 1815 was first published in THE BONESHAKER no. 198, August 2015, in England under the title “A Fairy Tale on Two Wheels” (please see attached download). The creator of the Tambora hypothesis Prof. Dr. Hans-Erhard Lessing, who supposed an influence of the volcano on the invention, was involved from the very beginning in this article and added his response there. It was a big surprise to discover that the Tambora hypothesis was based on a false quotation in the Proceedings of the 11th International Cycling History Conference (Cycle History 11) published in 2001 . The conference had been held the year before in Osaka/Japan. 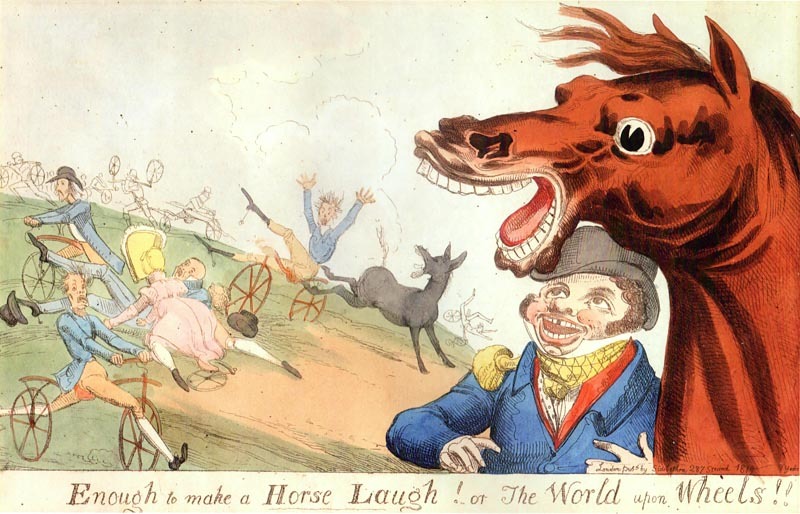 There, in a paper by Lessing, a large dying of horses in Mannheim in 1817 had been pretended. Actually there had been a reduced crop and therefore a scarcity of fodder caused by bad weather during 1816, which was provoked by long–lasting ash clouds of the volcano Tambora in the northern hemisphere. Its eruption had been in 1815. The idea of the author was that this must have inspired the Baron Karl von Drais in Mannheim to invent the running machine in order to replace horses. The false quotation referred to an announcement of the local newspaper “Mannheimer Intelligenzblatt” of 24 June 1817, but in fact this source did not mention any death of horses at all! It had taken some effort to get the very rare newspaper from 1817, which still exists only in two issues in Mannheim and Heidelberg, to compare it with the Proceedings of Cycle History 11. And these turned out to be as rare, as they exist only in two German public libraries in the Sporthochschule in Cologne and in the Deutsches Museum in Munich. This may partly explain why no other attempt is known to reconsider the Tambora hypothesis. The American linguist Gillen D’Arcy Wood had not hesitated to take over at face value the pretended genesis of the running machine in his book “Tambora” (2014). In his epilogue he referred explicitly to Cycle History 11 and there, encouraged by the supposed big horses’ death in Mannheim, he estimated “the death of countless thousands of horses” in Europe without any evidence. And he also agreed on the speculation about a decimation of the preindustrial transport system. In a chain reaction from Cycle History 11 to Wood’s book “Tambora” some German newspapers adapted again this story without any proof for their articles about the 200th anniversary of the eruption of the volcano (DIE ZEIT, 19 March 2015 & DER SPIEGEL, 4 April 2015). Shortly after that Lessing confirmed the mistake of the proceedings and even called it a fake. But the question why he had not corrected it in 14 years was answered by him with the evasion that he usually did not read his papers any more once they were published in English(!) – see download p7. And then strangely enough he continued to pretend a large dying of horses in Mannheim which was as wrong even without quotation marks as it had been with – there just does not exist any evidence. The author had been the victim of an error as he had totally misunderstood the announcement of the „Mannheimer Intelligenzblatt”. There was proclaimed a corn export ban in the Grand Duchy of Baden to stop frontier-crossing speculation. This led to a disruption of the trade links which Lessing obstinately misinterpreted as transport links in spite of having been informed about his error. He needed this misinterpretation as an argument to maintain his fantasy that “there were no draught horses any more” (Automobilitaet, p138; The Boneshaker no. 198, p8). By the way: When he reported the delivery of Russian wheat in 1817 via Rotterdam to the Mannheim harbor he had to depend on the existence of horses which pulled the ships up the river Rhine. Enigmatically he then declared these animals as extinct when the wheat should have been transported subsequently across the country. Furthermore, another blemish of the Tambora hypothesis appeared by the assertion of a complete crop failure in 1816 (Cycle History 22, p182/183); again presented without any evidence just to dramatize artificially the situation in the background of the invention of the running machine. But it is a fundamental error to believe the loss – especially an imagined loss – of horses would enforce a certain invention. No horse dead or alive could ever guarantee to pop up such a revolutionary idea like the one-track-vehicle. Although international bicycle historians had been left for 14 years with such a completely wrong information the leading experts still kept their doubts (Cycle History 22, p180).